How Would you like to spend a night here? 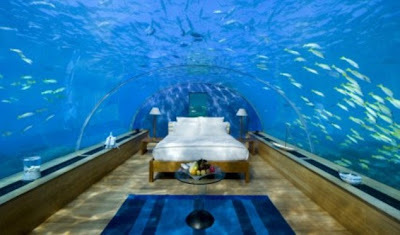 This is a hotel in the Maldives. "When it comes to honeymoon destinations, most newlyweds have set aside a nice little bundle for their ultimate getaway. But a unique suite in the Maldives - while offering unbeatable views of the local marine life - is likely to eat up the entire average wedding budget, let alone the honeymoon accommodation costs. Conrad hotels are offering a breathtaking suite at their Maldives Rangali Islands resort, which has to be seen to be believed." Check out more pictures at the link. 35 Foot Dive Into 12 Inches of Water! !